Mayor Terry Maguire of Park Ridge, New Jersey honored hometown hero James Gandolfini today by renaming an avenue after the late actor. Several members of Gandolfini’s family were in attendance as well as some of Gandolfini’s cast mates from the hit HBO show The Sopranos to pay tribute. Attendees included Dominic Chianese, Tony Sirico, Steve Schirrippa, Vincent Curatola and Vincent Pastore. Gandolfini was a native of Park Ridge and a graduate of Park Ridge High School. He graduated from Rutgers University. 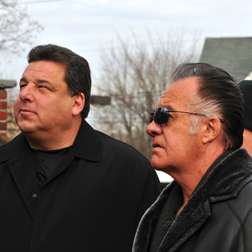 When “The Sopranos” star died of a heart attack in Italy in June, he was mourned by Gov. Christie as a “the True Jersey Guy”. Gandolfini’s latest film “Enough Said” is currently making the rounds for nominations this awards season.